The Music.app on your iPad shows lyrics of only those songs that already have lyrics embedded in them. For other tracks it doesn’t show any lyrics whatsoever. 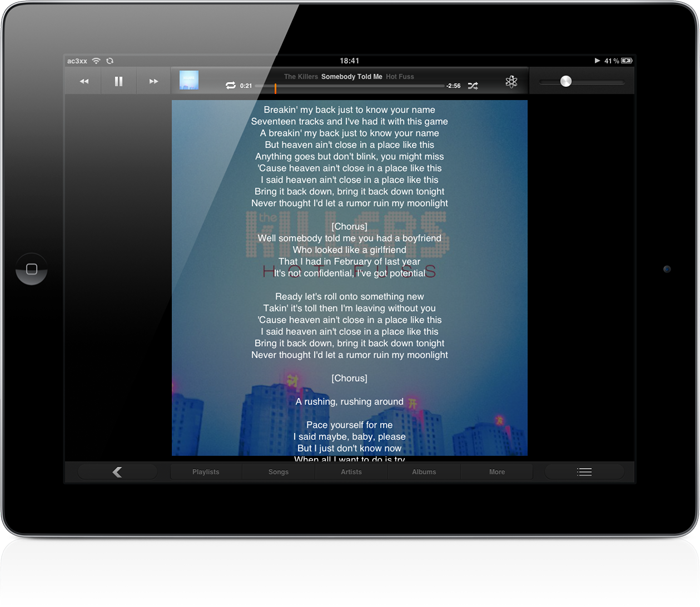 Wouldn’t it be awesome if you could get the lyrics for every song that you played on your iPad? I know for one I would really like that, because I love singing along to them songs! Lyricalizer is a new jailbreak tweak that adds instant lyrics for every song that you play on your iPad. Once the tweak gets the lyrical information for a track, you don’t have to look for it ever again. However, the lyrics don’t get transferred to iTunes, so you’ll only have access to the lyrics on your iPad. The tweak looks for the lyrics on either MetroLyrics, AZLyrics or Lyrics.com and yes it does require an Internet connection. The developer of this tweak has currently released this only for the iPad, but will soon make it available for iPhone and iPod Touch as well. Once installed, you just have to tap the small album artwork in the now playing bar at the top of the music app. It’s not working for me since a weak ago! Is this tweak not compatible with the iPad 3 or iOS 5.1.1? After installing it, nothing shows up. Even the lyrics I added through iTunes dont show up.